Improving heart health, enhancing cognitive ability and prolonging the life of cells are just three of the benefits of a PQQ supplement. PQQ acts positively on the body and mind on a very fundamental level; protecting and encouraging new growth of delicate energy-producing structures within cells known as mitochondria. Every cell in our body relies on mitochondria to generate its energy. Key functions from repair, to growth, to signalling, to controlling the cell’s life cycle are down to these important structures. PQQ – or Pyrroloquinoline quinone – is a supplement that supports mitochondria – the essential cell-energy producers. Not only does PQQ stimulate growth of new mitochondria, but it also protects existing mitochondria and therefore, the cell itself from oxidative stress, damage, and in effect, cell death. This means that processes like aging can be slowed down, and energy transmission and efficiency can be boosted. This is in addition to benefits like cognitive function and memory being improved with supplemental PQQ. Even though mitochondria are the ‘engines’ of cells and biochemical energy production, they are the most vulnerable structures to oxidative damage. Unlike cellular DNA, which has its own protective protein coating, mitochondrial DNA is exposed to damage by free radicals as it possesses few defences. It’s entirely dependent on anti-oxidants to protect its integrity and scientists have recognised that PQQ is the incredibly stable and powerful antioxidant that protects the delicate composition of mitochondria. Of course, everything in our body is made up of cells. Without the ability to repair and properly power the processes that cells need to go through, we get cell death. On a practical level, this means accelerated aging, and less efficiency in cell function. This is especially pertinent to areas where mitochondria are particularly at risk of damage from more intense use -the brain and heart. The easiest way to describe PQQ’s method of action is to liken it to a vitamin. It’s a powerful antioxidant -protecting the cell’s mitochondria from invading free-radicals that damage and age cells. PQQ protects brain cells, in particular. Extensive tests show that it improves long and short-term memory and fights age-related memory decline and protects the neurons from excitotoxicity – the harmful result of long-term overstimulation of neurons. This is associated with many neurodegenerative diseases like Parkinson’s and seizures. It also hinders the gene known as DJ-1 from self-oxidisation, a precursor to Alzheimer’s disease. By neutralising hydroxyl and superoxide invading radicals, mitochondrial dysfunction can be avoided. On a basic level, a major biomarker of aging is mitochondrial dysfunction. These mental benefits hinge around the fact PQQ protects and repairs existing mitochondria and stimulates the growth of new mitochondria, especially useful in keeping aging brain cells alive. In terms of heart-health, PQQ reduces the effect of invading free radicals and reducing oxidative stress. In the case of a sudden heart attack, damage would be reduced if supplemental PQQ is taken before or shortly after the event. There is also the benefit of PQQ increasing metabolism in a cellular level -positively affecting blood pressure, cholesterol and fighting a leaning to obesity. Naturally occurring in our body PQQ is responsible for a multitude of essential cell functions. Signalling mechanisms for growth, reproduction and immune function, PQQ is a very valuable and versatile substance indeed. As it protects and stimulates mitochondria, it has an ability to effectively slow down the aging process of the cell and by extension, every single tissue in the body. In doing so, and specifically acting upon brain cells, the immediate effect of supplemental PQQ is improved memory and faster cognitive function. A PQQ supplement thus becomes a powerful compound that enhances mitochondrial function. This means better output for the body’s energy cells as a whole. It also prevents mitochondria dysfunction -known to be at the root of serious diseases like type 2 diabetes, Alzheimer’s and heart failure. Getting the benefit of PQQ is easy, as one tablet taken with a meal, once a day, is all that’s needed. Side effects are nil, but as a precaution, PQQ should not be taken by pregnant or lactating women. For extra cell energy where it matters -at the source of cell power -add PQQ to your healthcare regimen today. 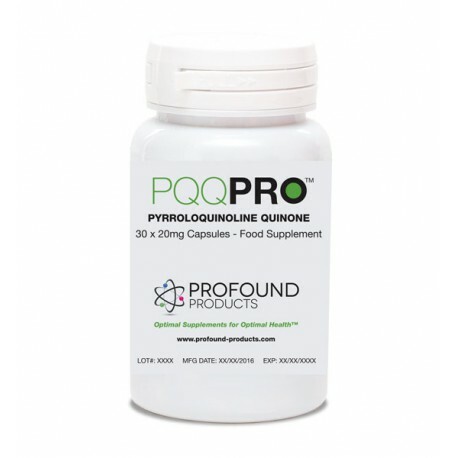 In 2003, the prestigious journal Nature reported on the discovery of PQQ -the first new vitamin discovered since 1948. Unlike any of the other 13 known vitamins, PQQ has specific benefits for the mitochondria -the ‘power plants’ of our cells that generate energy. Scientific evidence suggests that mitochondrial damage is one of the main causes of aging. BioPQQTM is a trademark of MGC (Japan), and is protected under multiple International patents.